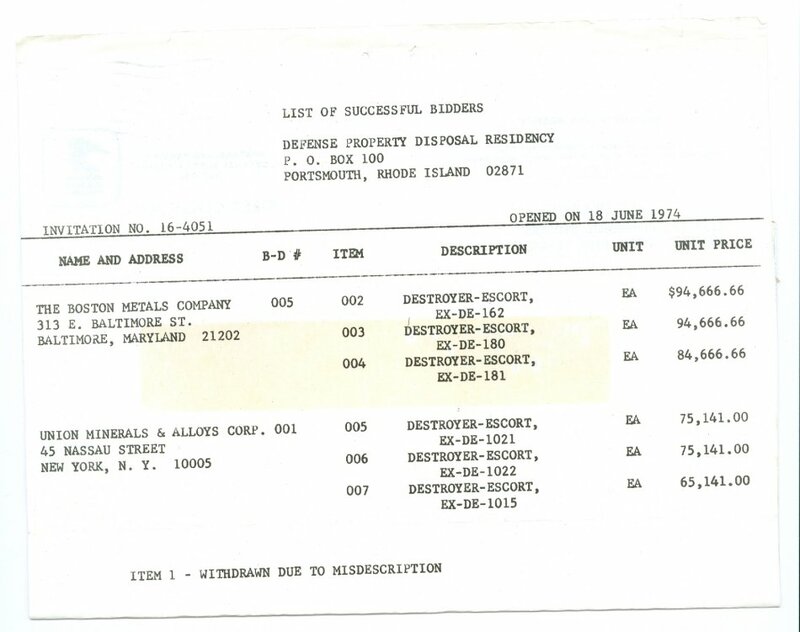 19 October 1942: Keel laid at the Federal Shipbuilding and Drydock Co., Port Newark, N.J.
15 November 1945: Placed "in commission, in reserve", joined the St. John’s River Group, 16th Fleet, at Green Cove Springs, Fla.
67k Uriah Phillips Levy was born in Philadelphia, Pennsylvania, on 22 April 1792. After several years as a shipowner and civilian mariner, he became a U.S. Navy officer in October 1812. He was a prisoner of war during the latter part of the War of 1812, but his career thereafter was active and fruitful. During the 1850s, he was an important figure in abolishing flogging as a Navy punishment. Levy commanded USS Vandalia in 1838-39, USS Macedonian in 1858 and was Flag Officer of the Mediterranean Squadron in 1860. He is also noted for his ownership and preservation of Thomas Jefferson's home Monticello. Commodore Levy died in New York City on 22 March 1862. 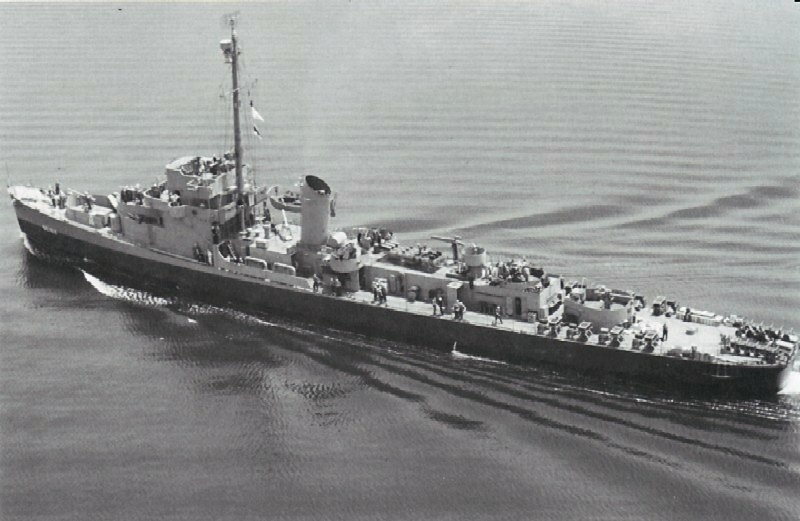 USS Levy (DE 162) (1943-1947) was the first ship named in his honor. 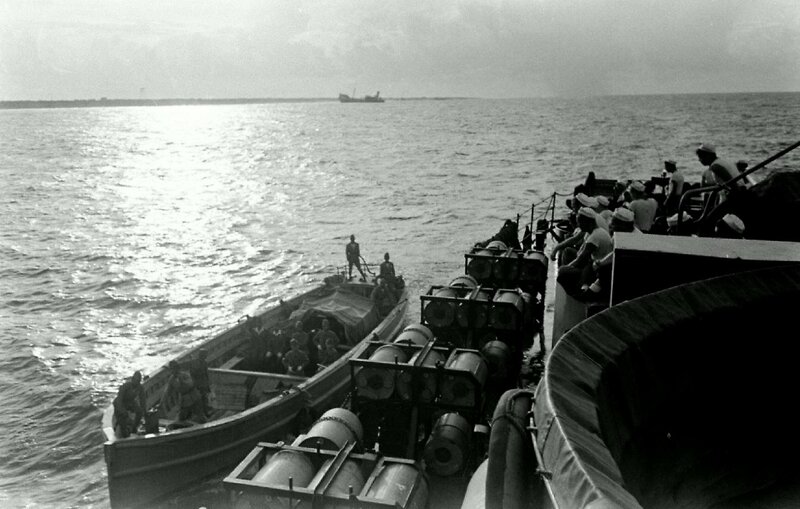 79k Undated Wartime Image: Levy underway in the Pacific. 93k 22 August 1945: Mili Atoll, the Marshall Islands - Japanese and U.S. officers negotiate the surrender of Mili Atoll on board USS Levy (DE 162). Identified U.S. officers present include (from left to right): Commander H.E. 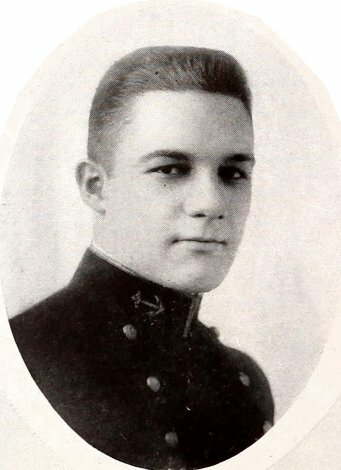 Cross; Captain H. B. Grow, USNR, senior U.S. officer present; Commander W.C. Burkhard; Lieutenant P.S. 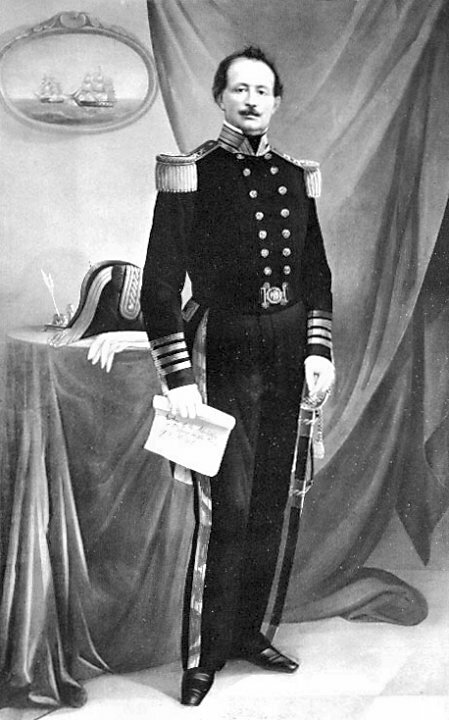 Breck, Jr.; and Commander C.G. Olson. 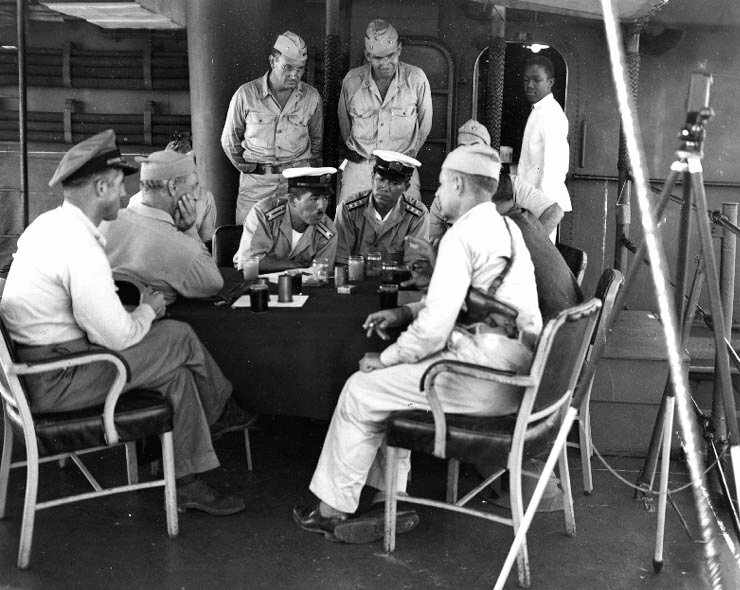 Japanese officers in center include an unidentified junior officer, at left, and Japanese Navy Captain Masanori Shiga. Note the pistol shoulder holster worn by U.S. officer in right foreground, fancy rope decoration on stanchions, metal wardroom chairs and steward in right background. 138k 28 August 1945: Mili Atoll, the Marshall Islands - These guys sure look happy to have the war over. 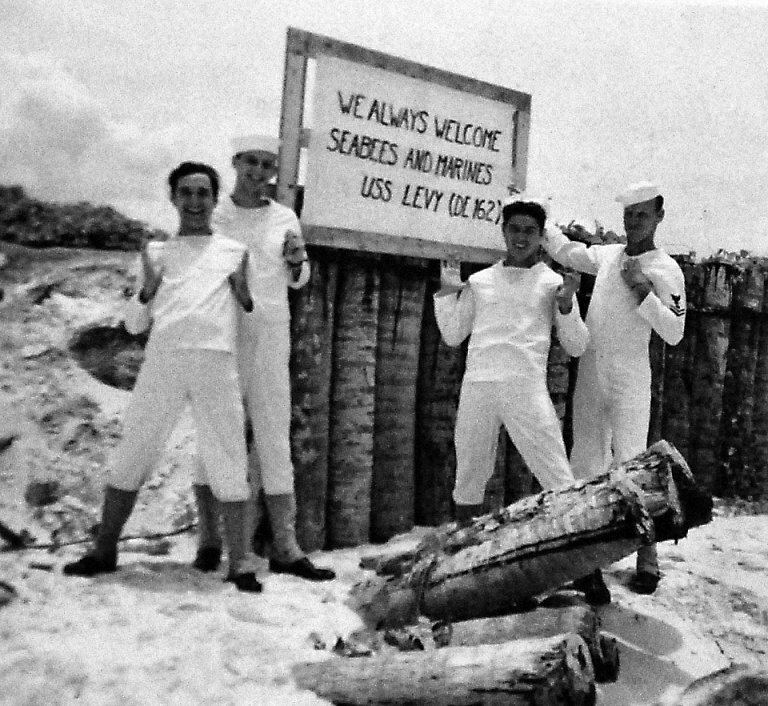 "Mille Atoll, Marshall Islands, shown these sailors from USS Levy (DE 162) pointing with pride their sign, which reads, “We always welcome Seabees and Marines”. 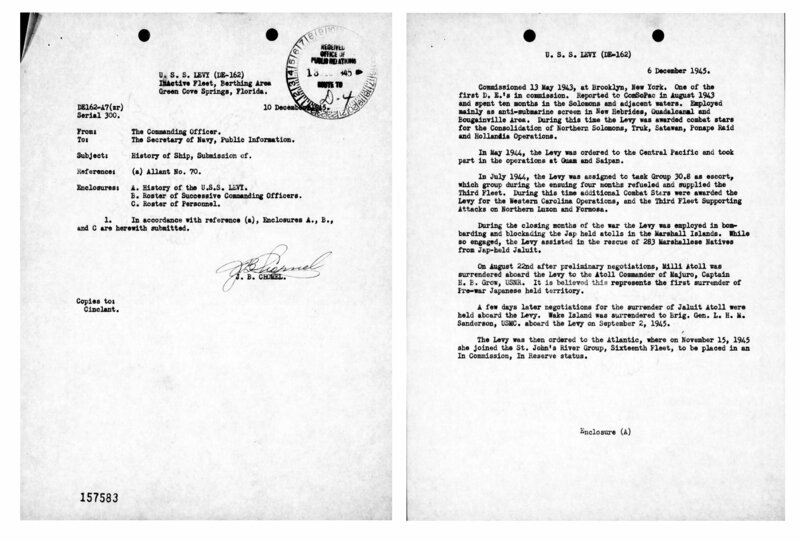 This beach head became the first Japanese territory in World War II to formally surrender to United States forces. Shown (left to right): SM2 Abe Klotzman; YN2 Irwin Schwartz; Coxswain Henry Jendrzejanski, and EM2 Kenneth Werton. All the sailors were Navy Reservists. 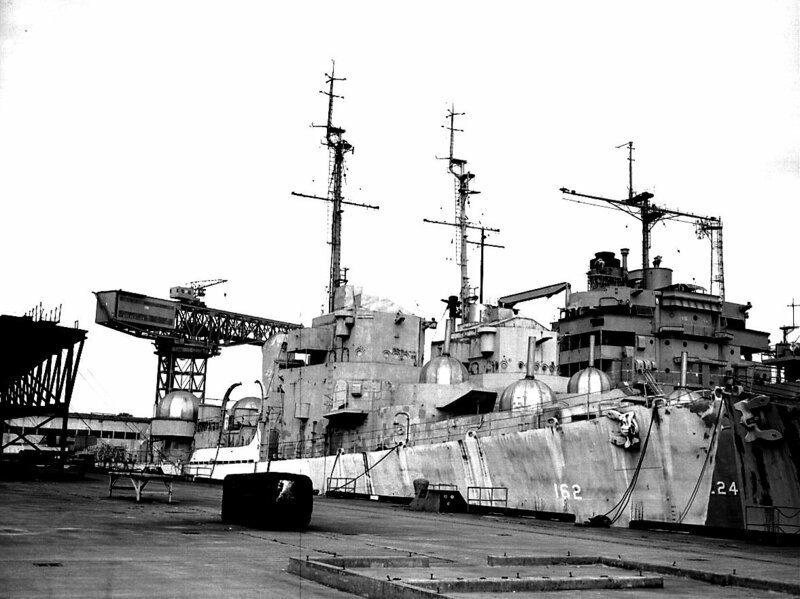 View the USS Levy (DE 162) DANFS history entry located on the Naval History and Heritage Command web site. 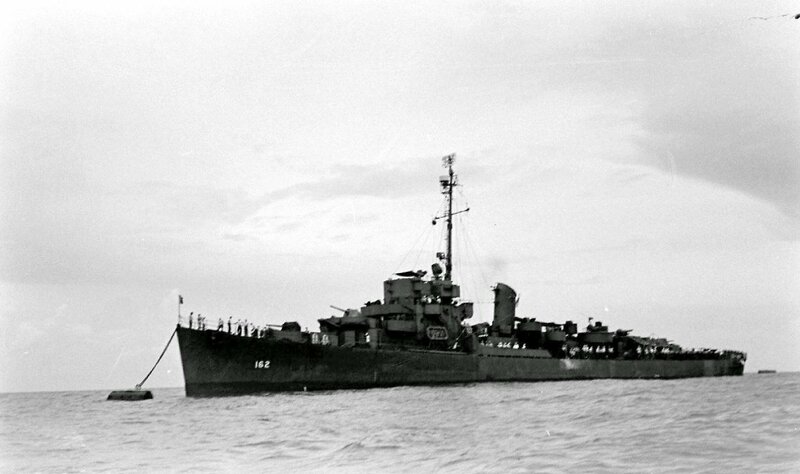 View the official War History of USS Levy as submitted by the ship at war's end. Address: 48 N. 6th St.